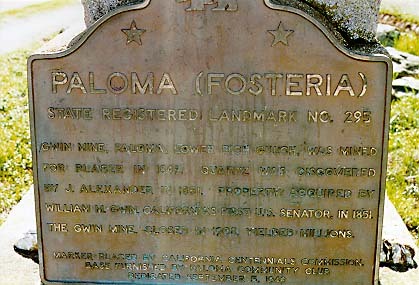 Gwin Mine, Paloma, Lower Rich Gulch, was mined for placer in 1849. Quartz was discovered by J. Alexander in 1851. Property acquired by William M. Gwin, California's first U.S. Senator, in 1851. The Gwin Mine, closed in 1908, yielded millions. Nothing remains of this site. Intersection of Paloma Rd and Edster St, 5 mi SW of Mokelumne Hill. Return to other landmarks in Calaveras county. Please note: I have no connection to any organizations mentioned on this site.